After watching a family (Mum, Dad and two little ones) blissfully cycling together down the High Street on a Sunday morning my initial thought was, ‘Me on a bike? You have to be kidding!’ and then on reflection I started to think of the positives and this made me question. Could cycling really improve family life? Bicycles and I have never really seen eye to eye. As the oldest of three siblings I was the last to get to grips with riding my bike. Stabilisers were a fixture for quite a while! When my brother was six, I bravely gave him a ‘backy’ home only to get his foot stuck in spokes which broke his ankle. (Poor boy – he has forgiven me since then!) To top it off I was the only one in my primary school class who failed their cycling proficiency test (how embarrassing!) To put it plain and simply hand, eye and leg co-ordination just isn’t there! When I started university I thought I would give cycling a second chance as my friends had started cycling into University and it was a good 40 minute walk from my house to campus. I got hold of a second hand bike and attempted to cycle it. On the first attempt the tyre went flat so I turned around and skipped my lecture (naughty I know!). On the second attempt my seat fell to its lowest point and I was left cycling with my knees near my chin right under the handle bars. I had to desert my bike and walk the rest of the way in. Like a true soldier I persevered and resolved the seat issue and cycled home. I could not believe things could get worse…and then they did! Going uphill I got stuck in the middle of a junction. No matter how hard I pushed the pedals, I was not moving forward. To add to my distress a man was trying to turn right into my junction. He was beside himself in fits of laughter and in the end rolled down his window and said ‘I can’t watch anymore love, get off and push!’ Total humiliation! Not to be defeated I blamed the rubbish bike and not my unfit, uncoordinated being and asked Father Christmas very nicely for a new bike. He was either kind or liked a good laugh because he gave me my wish! A shiny pink mountain bike! I am however ashamed to admit that I rode it twice, decided walking was much easier and it is now eight years later silently rusting in my shed. Obviously the family as mentioned at the beginning started the cogs turning but then I saw this in the paper this week! Oh my how amazing! I wish I had seen this when I had my first-born. I can totally imagine me riding this round the village and it looks like a breeze. 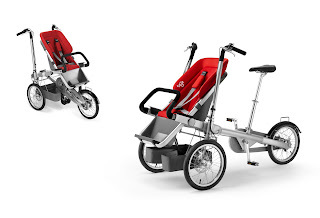 It is called a Taga tricycle stroller abd it converts from bike to stroller in 20 seconds! You can find them here www.taga.com.au and on facebook www.facebook.com/TagaAustralia .I think it appeals because it has three wheels and ‘to stroll’ does not sound too strenuous! I think this bike would have made me lose the baby weight so quickly and BBwould have loved it. This got me thinking about the future…it will be so much fun trying to teach Noah, Florrie and Zachary to ride a bike (well in honesty Nick teach and me shout important observations in regards to what he is doing wrong) and I then don’t want to be excluded from the fun once they can cycle. I now feel there could definitely be an inner cyclist bursting to get out – not in a Lycra, fluorescent yellow kind of way but in a family cycle rides, basket on the front, picnic kind of way! I really do want to encourage my children to enjoy the outdoors and not be cooped up inside and I feel I probably need to help lead by example. I do feel cycling could indeed enhance family life. Although the prospect of me on a bike is very VERY daunting the idea of family picnic from some healthy exercise is quite appealing and although I may make myself look a complete idiot, how hard can it be? They say you never forget…it’s like riding a bike! 9 comments to Unveiling My Inner Cyclist! A very entertaining account which is so true to life! With two slightly older girls (9 & 7) your blog is bringing back many memories of their earlier years! I now wish I had kept a diary, so if nothing else this will provide you with the memories we think we will hold on to but rarely do! Oh no, the dreaded bicycle! This is an item of torture that at some point I am going to have to embrace, but I can't deal with it yet. I'm the youngest of 4 and my eldest brother at the age of 11 crashed into a lamp-post and split his head open. Thanks a bunch because it then meant that none of the rest of us were allowed bikes until 13! And somehow I missed out. My friend taught me how to ride her bike in the lane behind her house which was unfortunately straight. Therefore I never learnt how to turn a corner. I've not been on a bike for 20 years, since I fell off my friend's bike while wearing sandals and cut my foot open getting gravel in it. Mum found out how and I gave up because it was clearly dangerous! A brilliant link-up to ShowOff ShowCase, thank you! I'm sorry but I probably would have laughed along with the guy at the junction. I have always loved cycling and couldn't wait for the day that I could get out cycling with my little one riding pillion behind me but in my infinite wisdom I bought a mountain bike with a split frame and therefore I can't carry a child seat – muppet!! ooooh do they have one of these for twins?? What a workout!